When I’m flying First Class, I usually try to arrive at the airport a little earlier in advance, so that I get to sample the full range of the airline’s First Class ground experience. Upon arriving at Seoul Incheon Airport with two hours to spare, then, I was both delighted and disappointed to learn that our Asiana Airlines flight to Los Angeles had experienced a full two-hour delay, and that we’d now be departing at 10:40pm. Delighted because I’d now have even more time to enjoy the First Class Lounge, but a little disappointed that I could’ve used that time to explore more of Seoul during my layover. We proceeded to check-in at the dedicated First Class counters, where we were informed that the delay was related to the inclement weather in Los Angeles, and were each given a compensation voucher worth 20,000 Korean won ($23). Since we were planning to eat and drink in the First Class Lounge anyway, these vouchers would be of limited use, but we accepted them anyway. We breezed through security and arrived in the airside terminal. The Asiana Airlines business class and First Class lounges are located on the second level, and are open-air to the rest of the terminal. Follow the signs to the First Class Lounge, and then take the escalators up a level. The lounge is then positioned across a walkway. Access to the lounge is available to First Class passengers on Asiana Airlines or other Star Alliance airlines, as well as members of the Asiana Club program with certain elite status levels. There’s a map of the lounge near the entrance to help you get your bearings. The lounge is basically in the shape of one giant rectangular room, and seems to be designed in the image of an old library or cigar parlour. The mahogany woodgrain furnishings, together with the colour palette of browns, beiges, and reds, adds to this effect. I’m not the biggest fan of the lounge’s appearance, to be honest. The classical-style finishes certainly make for a distinctive look, though I’m not sure it’s the best fit for a First Class airport lounge in a modern facility like Seoul Incheon. The main hall of the lounge mostly consists of seating areas, grouped into smaller clusters with the use of half-level privacy partitions. The “nooks” in the far side of the lounge have a particularly nice ambience, and there are even a couple of chaise longues in this area for you to spread out a little. It’s a shame that the outside windows have privacy blinds taped to them, as you’d otherwise get some very nice tarmac views from here. The open-air layout and lofted ceilings contribute to making the lounge feel quite spacious; however, it also means that you can hear a lot of the commotion coming from the main concourse, which kind of takes away from the feeling of privacy and exclusivity that one would expect from a First Class Lounge. Deeper into the lounge, there’s a grand piano, although there was never anyone to play it. I imagine every now and then a guest would play something, but I really think that having one of those auto-playing pianos here to provide some ambient music would fit well into the overall theme and decor of the lounge. Opposite the grand piano is the main dining area. There’s a small buffet spread, together with seating space with about half a dozen dining tables, although you’re of course free to bring your food elsewhere in the lounge as well. There are also a few high-top chairs to the side of the dining area. The buffet spread was pretty limited, with fried shrimp, chicken drumsticks, mixed vegetables, and dim sum representing the entirety of the hot food selection. The fried shrimp was quite delicious, although the other items didn’t leave much of an impression. It certainly would’ve been nice to see some authentic high-quality Korean dishes as well, and I was surprised that the lounge didn’t offer that. There was also the usual cheese, pastries, and salad bar, together with coffee, tea, juices, and alcohol as well. Perhaps the most appealing item in the buffet was the Häagen-Dazs ice cream, which came in four different flavours. There were even ice cream sandwiches available, and Jessica and I must have had three or four of them over the course of our time in the lounge. In addition to the buffet, you could also order noodles (ramen, soba, or udon) from the lounge staff, and they’d would be prepared in the kitchen before being brought out to you at your seat. I ate two bowls of udon – they were excellent! The lounge also has a few other facilities, although they all felt a bit underwhelming. First there was the TV & DVD room. You might expect to find a home theatre setup, but nope, it was just four side-by-side cubicles with small TV screen in front a lounge chair. There’s also a Massage Room, although again, it didn’t feel like this feature was used to its fullest. 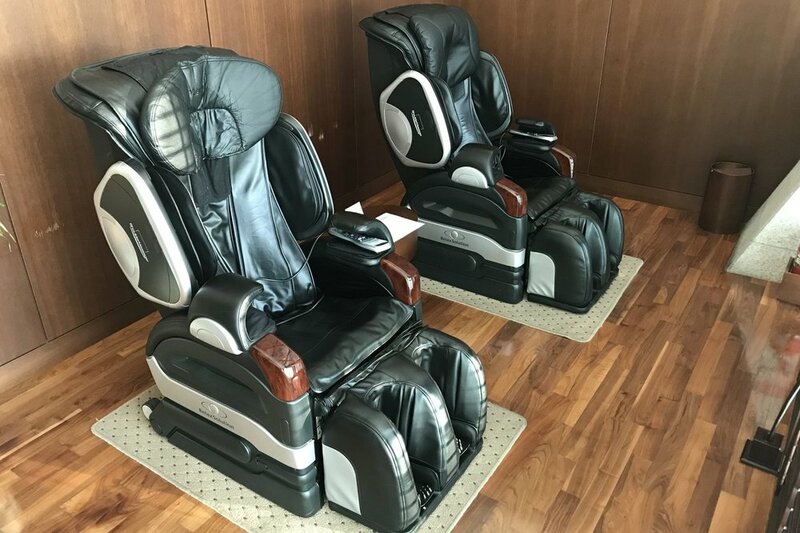 In other First Class Lounges around the world, a “Massage Room” might raise hopes of a complimentary 30-minute spa treatment, but here it was simply a room with two electric massage chairs. The bathrooms and shower rooms are located towards the back of the lounge. I didn’t make use of the shower rooms, although I did take a peek inside, and they looked quite nice. Alas, there’s only so many Häagen-Dazs ice cream sandwiches and portions of udon noodles that one can eat before getting bored, so even though I had scheduled extra time to enjoy Asiana’s First Class ground services before my flight, I ended up feeling quite disappointed with the First Class Lounge. There simply wasn’t much at all that was special about the lounge, so after about an hour, I decided to go off to wander through the massive concourse of Incheon Airport instead. As it turns out, I was able to spend my 20,000 KRW meal voucher at any food & drink outlet in the airport, so I got myself some free Korean mochi snacks to compensate for our delay. I also wandered by our departure gate and had a look at the Airbus A380 that would be bringing us to Los Angeles. 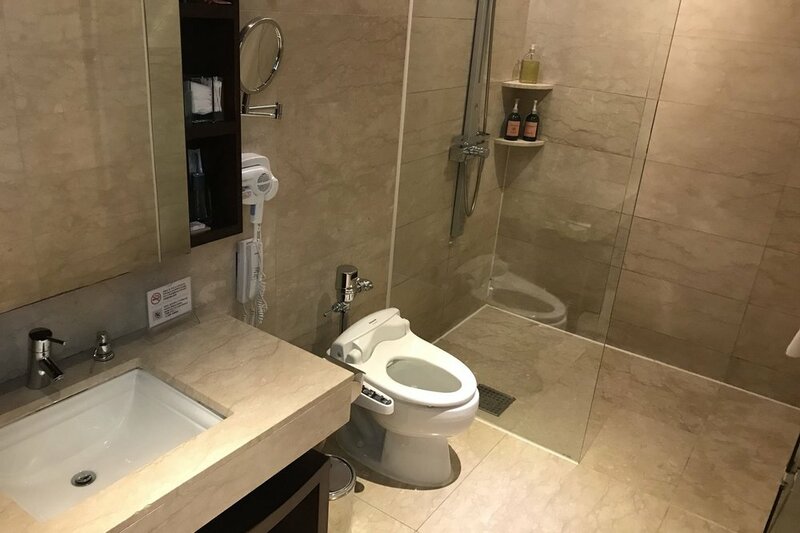 Given my disappointing experience in the First Class Lounge, I was feeling rather excited to get onboard, and I was hopeful that the in-flight experience would be a step above! Sorry Asiana, but your “First Class Lounge” is really a glorified business class lounge at best. The decor of the lounge feels rather out of place, and the food offerings are limited (although the Häagen-Dazs and noodle dishes are certainly a redeeming quality). And that’s saying nothing of the complete lack of true First Class ground services that’s offered by many other airlines around the world, such as à la carte dining. On the bright side, looking at the Asiana website, it does seem as though the airline has recently opened a new First Class Lounge, which at least looks to have a more modern design. I’m not too sure whether the new lounge replaces the old one entirely, or whether First Class passengers will now have access to both old and new lounges, but I’d certainly hope that it makes for an improved ground experience!